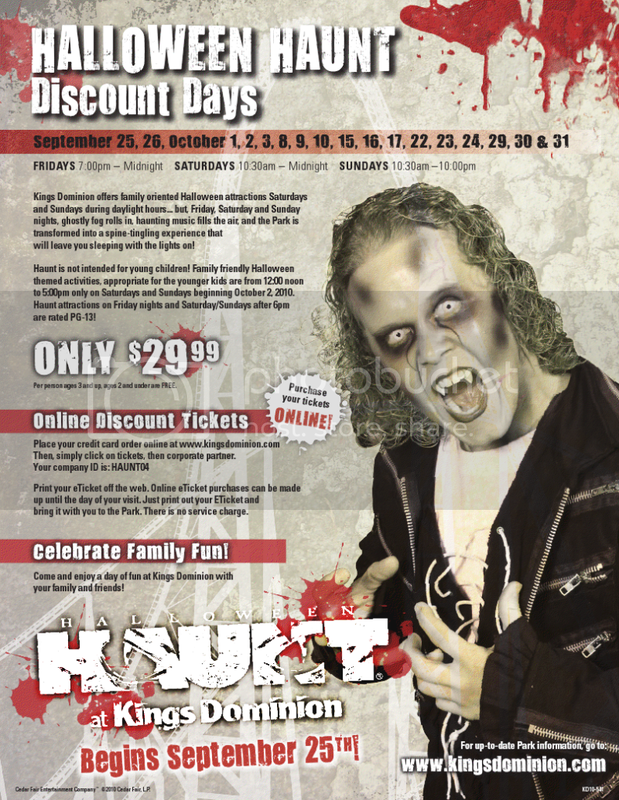 Getting your scare on at Kings Dominion’s Halloween Haunt this October? The $56.99 regular ticket price is pretty scary itself. Fortunately, there’s no need to pay that much for your visit – purchase tickets before your trip to the park to save the most money! Alternatively, make time to visit the Henrico County Recreation and Parks Department to score “Fall Fun” Kings Dominion tickets for only $29! Other counties have similar discount arrangements; call to ask. Otherwise, tickets cost $41.99 when purchased online three days in advance of your trip. Buying online less than three days ahead costs $46.99. If you’re just going for an evening scare, Friday night admission and Saturdays and Sundays after 4pm cost $34.99 (The Saturday or Sunday “Twilight” tickets must be purchased online). Finally, if you purchase a 2011 season pass, you can receive free admission one day this fall. Since a Value Pass is only $59.99, this might be a good choice if you know you’ll visit again at least once next summer. Prices go up after October 31. The Haunt opens this Saturday, September 25th, and runs Fridays (7pm-midnight), Saturdays (10:30am-midnight), and Sundays (10:30am to 10pm) through October 31.